In an effort to address Nepal’s post-earthquake housing crisis, a new INBAR initiative is harnessing the country’s abundant bamboo resources to rebuild devastated communities and promote sustainable livelihoods. In April 2015, a large earthquake left over 300,000 people homeless in Nepal. Over 730,000 structures affected by the earthquake are now in need of upgrading. Bamboo offers a rapid solution to the country’s chronic housing needs, offering an affordable, durable, and highly renewable source of building material. The plant is also widely available, growing in 73 of Nepal’s 75 districts. The plant is being harnessed in a new initiative funded by the Common Fund for Commodities (CFC) and implemented by INBAR in partnership with the Government of Nepal, the International Centre for Integrated Mountain Development (ICIMOD), and ABARI, a research and design firm that promotes the use of natural materials in contemporary design practices. 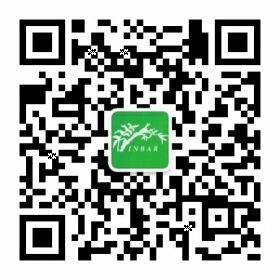 The initiative will build on a 15-year partnership between INBAR and private sector partners in Nepal, a collaboration that has developed a number of modern bamboo building systems that meet national building codes and international ISO standards, and have excellent anti-seismic properties. These models have received wide recognition and have been implemented in many reconstruction activities in post-earthquake Nepal. 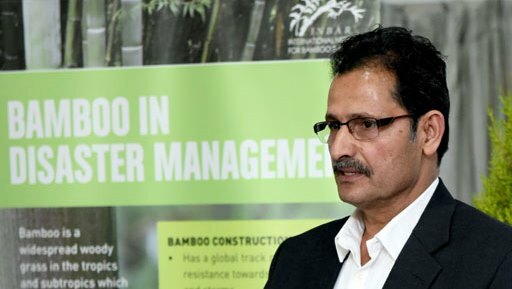 The sustainable use of Nepal’s 63,000 hectares of bamboo forests will aid Nepal’s recovery in additional ways: generating local employment; reducing vulnerability to future earthquakes – bamboo has higher tensile strength than steel and greater compressive strength than concrete; removing the need for imports – construction material will be sourced locally; and protecting foreign currency reserves. The plant also helps to restore degraded lands and stabilise areas affected by landslides – the Government of Nepal has explicitly recognised this benefit in its post-disaster review and intends to use bamboo extensively for this purpose. The new partnership was presented at a workshop, held in Kathmandu on 1 March, to a wide range of stakeholders – including ministers and officials from the government of Nepal, industry experts, and representatives from non-governmental organizations and civil society. Given its traditional use as a building material in Nepal, all agreed that bamboo should play an important role in the country’s recovery. Agni Prasad Sapkota, Nepal’s Minister of Forest and Soil Conservation, delivers his opening address. The plant’s versatility and strategic benefits were further outlined by Basanta Shrestha, ICIMOD’s Director of Strategic Cooperation. “The sustainable use of bamboo in reconstruction efforts can help Nepal ‘build back better’,” he said. Shrestha also highlighted the Centre’s ongoing support to earthquake recovery and reconstruction through the development of an integrated information platform, support to hazard mapping and assessments, development of a framework for resilient livelihoods in earthquake-affected areas, and setting up a ‘smart mountain community’ model village. During the workshop, participants highlighted various post-disaster programmes currently being undertaken in Nepal and discussed potential opportunities to scale up and incorporate CFC project models into larger post-disaster reconstruction efforts. The current CFC project will build 150 homes and ten transitional schools by May 2016. The major success of the project has been the validation and approval of a bamboo based school design, which could be used to rebuild many of the 7000 schools destroyed during the earthquake. 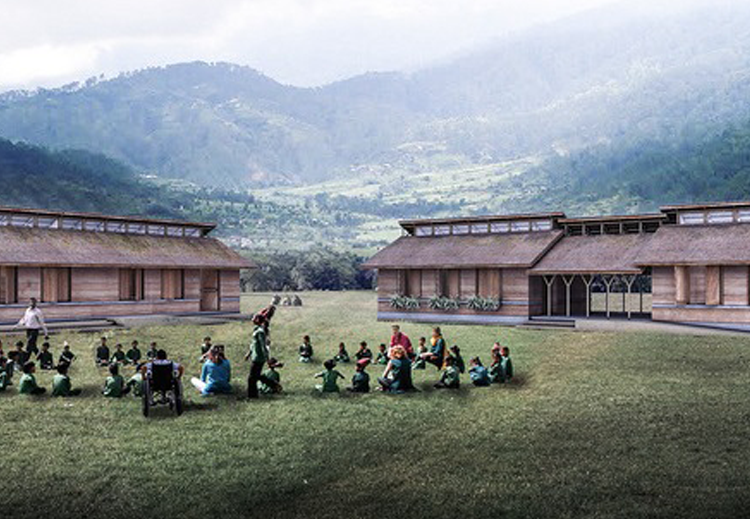 The school design will now be one of the recommended designs taken forward by Nepal’s government. “The building of bamboo schools are not only ‘climate-smart’ but also economically viable as it will promote local materials and traditional values, and strengthen the local economy.” said Dr. Madhav Karki of ABARI. While Nepal has excellent foundations in place, more coordination on bamboo initiatives is needed, with many activities still taking place in isolation. Participants agreed that although the Government of Nepal had drafted a national strategy for bamboo and rattan, this needed to be enacted with the Ministry of Forests and Soil Conservation – helping the Ministry to play a more effective convening role and supporting the simplification of regulations on taxation and the transport of bamboo between districts. In addition, efforts are needed to further develop formal supply chains – while Nepal produces around three million culms each year for scaffolding, there is little cultivation of bamboo and natural bamboo stands are rarely managed in a sustainable fashion. Communities need better access to more quality planting material, training, markets, and finance to make this happen. Also required is the development of a full set of design values, and the physical and mechanical characterization of all local bamboo species used for construction. An expert technical committee in Nepal would help achieve this. Finally, broader socio-economic and environmental initiatives need to consider including bamboo as a component of their wider reconstruction programmes. 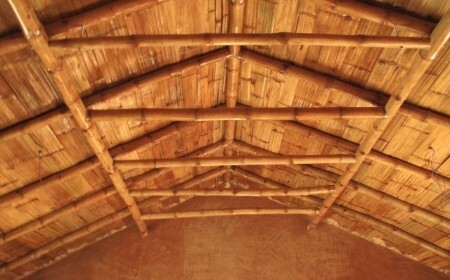 – Bamboo-based low-cost housing technology.